We’ve all seen them on Pinterest.The perfect offices filled with amazing furniture, bright windows and a reading nook. I mean, really, who has this kind of office? If you are part of Corporate America, it’s probably more like cubes, mismatched furniture and bare walls. Or maybe you work from home and have taken over a corner of your guest room. Or if you are really special you have your very own cloffice like me? Well, don’t fear my friends! It can still have style. Here are 7 ways to give your “office” some glam. Whether it be a cubicle, folding table or a dedicated space, let’s make it pretty! Let’s start by glamming up some basic black office supplies- FOR CHEAP. 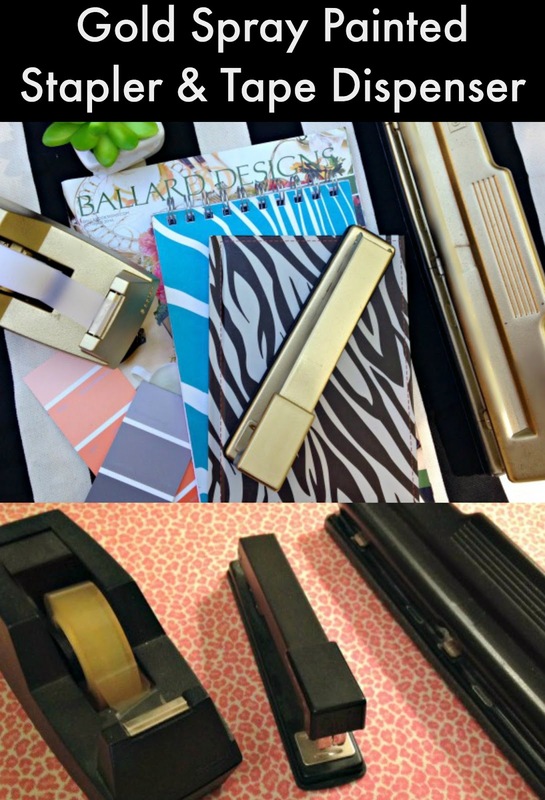 Take a look around and grab that boring tape dispenser, stapler and 3 hole punch. This is such a simple makeover that I can’t believe I have never thought to do before! I mean, how much happier would I have been stapling all of those power point presentation decks if my stapler was GOLD?!?!?! But don’t just stop there, see how I gussied up some plain Dollar Store Scissors here! Are there piles of forgotten bulletin boards in your company’s supply closet? Go ahead and grab one because with a little fabric it can be fantastic! Here you can see how I added some cream fabric and black ribbon to an old bulletin board. I just used a staple gun to affix the fabric and ribbon. This was the perfect inexpensive art for my office. Say it with me- JUST SAY NO TO FLUORESCENT LIGHTS! Even if you are in a cube, you can still add some major ambiance with a lamp. It’s amazing what a little extra lighting will do. If you are in your own office, I always loved turning off the overhead lights in the morning and easing into my day. OK, I understand you don’t want to be TOO comfortable at the office but why not add a throw pillow to the guest chair? Or maybe a rug if you have a little spot? A little bud vase that you keep a flower in? Why not add a little chalkboard for people to leave you notes if they stop in? Just a few little things to make it feel comfy and homey! By now you know I love a good monogram. So, let’s think about ways to personalize your supplies. I love adding a fun cover to my notebook binders and planners. This is SUCH an easy way to make the expected a little more unexpected! Bring in your favorite mug or Tervis Tumbler. A cute monogram cup holder? Just fun ways to take your office from boring to ca-ute! Inboxes, mail collectors, file sorters. Why not grab a few fun patterned ones and add them to the mix? I have seen them in the Target Dollar spot or at Homegoods. If you already have some standard ones you could always cover them with cute wrapping paper. Who wouldn’t walk into an office and smile if they saw this cute business card holder? I just glued two oyster shells together and painted the inside gold. But maybe you could use a big conch shell, a cute tray or even your favorite dish. Just think about something that will make you happy! OK, now let’s get on with this Monday… but can we agree that it’s time to make your office a happier place! I know, right? Such a simple fix but huge difference it makes! Glad you already had some paint on hand! What a brilliant idea! Our "offices" are being moved this month and work and finally the black walls are being taken down (yes black) so I thought it would be so nice to glam up my desk when everything is rebuilt. I may have to buy a few of my own pieces to glam up like this!! Black walls!?!?!? YES! You definitely need some glam up your space! Thanks for the invite! I will be there! I am sitting at my desk looking at my blah stapler. Off to buy some gold spray paint. I paint everything else not sure why I didn't think of the small things. Great idea!! Ummm…. BRILLIANT! Why haven't I thought to do this yet!? Thanks for the inspiration, Heather! LOVE THIS!! I am doing it now!! Thanks for sharing! I absolutely love the dog business card holder! Where did you find it? Thank you! Thanks! It was a thrifted find so can’t provide a source. Sorry! I love these ideas – simple and doable! I even already have a can of gold spray paint!